What’s up with all you oatmeal haters out there? Is it a texture thing? Because I know — thanks to recipes like this — that it couldn’t possibly be a flavor thing. I happen to love oatmeal. So when I came across this baked oatmeal recipe on Macheesmo, I knew I had to give it a try. What makes this recipe so special is that you soak the oats in a custard-like mixture overnight, allowing them to soak up all the delicious flavors. This also gives the oats a chewy, nutty texture, which is quite nice — especially when topped with toasted walnuts and dried cranberries and submerged in a puddle of warm milk. Oh. Yes. And by the way, there is no better smell to wake up to than this oatmeal baking in the oven. Heavenly. Who’s hatin’ on oatmeal now? Lightly grease an 8″x8″ baking dish. Mix eggs and brown sugar in the bottom of the dish, whisking to remove lumps. Add melted butter and carefully whisk to combine. 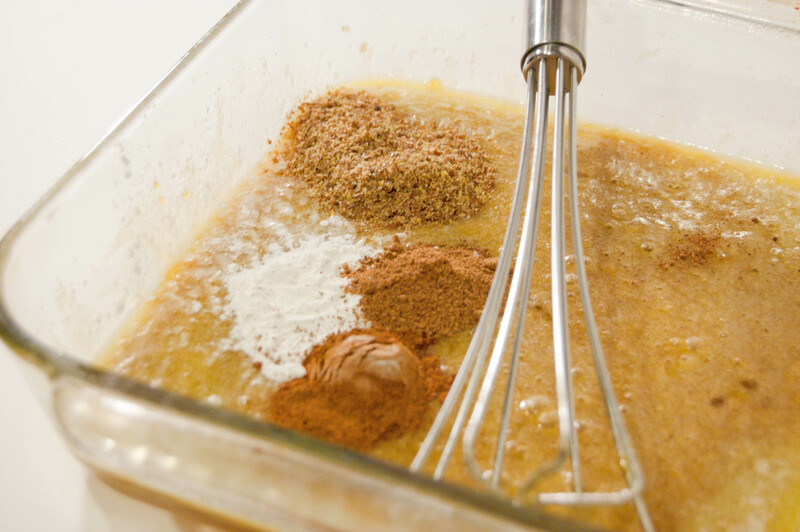 Add baking powder, vanilla, ground flax seed, cinnamon, nutmeg and salt directly to the dish and whisk well. Carefully add the milk and stir to combine. 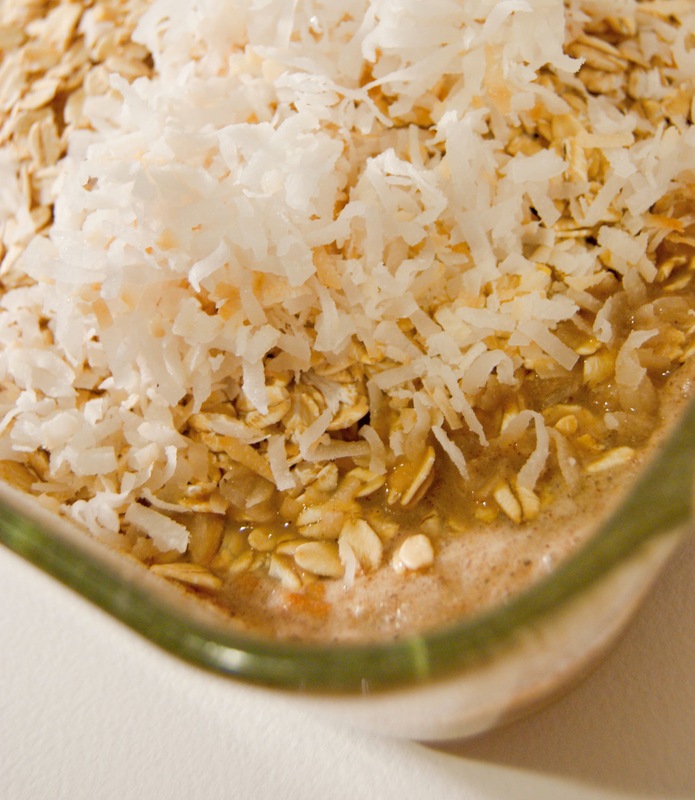 Add the toasted coconut and oats and carefully fold into the mixture, making sure everything is combined really well. Cover the dish with plastic wrap and refrigerate over night. The next morning, preheat the oven to 350 degrees and bake the oatmeal for approximately 45 minutes, or until the edges are brown. Remove from oven and let cool for a few minutes. 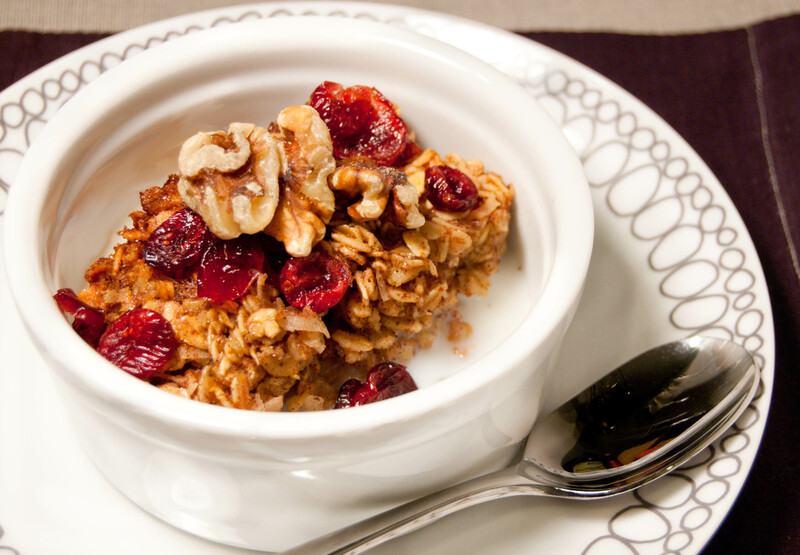 Then cut yourself a piece, top it with toasted walnuts and dried cherries, and pour some warm milk over the top. Enjoy! tire of it. This looks amazing!! That looks so delicious! And it’s a great pic, I hope you submit it to some of the food photo sites! I was just looking for a recipe for this. You read my mind. Great recipe…My kids would totally love this, minus the coconut! Gorgeous photos! I love oatmeal, and this looks great! Can’t wait to try it. another way to try it! It sounds really yummy! I love oatmeal especially this time of year.It is hearty and filling. I love the addition of coconut. Yum, this looks decadent. Must try. If you’re looking for super yummy oatmeal but don’t have time for a recipe like this, I’ve been using Bob’s Red Mill Extra Thick Oatmeal for a while because I like its chewy texture. Yay, oatmeal! have to buy it at a health food store? My grocery store has it! Thanks to everyone for all the nice comments! though. Can’t wait to try this! problem and it would work out great! I’ve never had baked oatmeal before but this certainly makes me want to try it! I love the flavors in this! Just made this, and it’s delicious! Thanks.